Hav Sultan Singh Narwaria hailed from Pipri village in Chambal district of Madhya Pradesh. Born on 19 June 1960, Hav Sultan Singh belonged to a family wherein many of its members served in the Armed Forces. Hav Sultan Singh was recruited into 2 Raj Rif of the famed Rajputana Rifles Regiment, a regiment known for its fearless soldiers and numerous battle and theater honours. During the Kargil war Hav Sultan Singh’s unit was deployed in Kargil area and played a very significant role during capture of various important ground features. By early May 1999, Pakistani forces had infiltrated well across the LOC in the Mushkoh, Drass, Kaskar and Batallik sectors. The extent of penetration across the LOC varied from 4-8 kms in various sectors. Following the operations by the IAF in the last week of May 1999, the Army launched major offensive in the first week of June and captured two key positions in Batallik sector by 09 June 1999. In the Drass sector, 2 Raj Rif was leading the operation to capture Tololing. 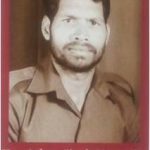 On 13th June 1999, Hav Sultan Singh Narwaria was the section commander of the section that was tasked to capture Rock area of Point 4590 in the Drass sector. The climb to the area was very steep and the position was very well defended by the enemy forces. Despite the odds of attacking the hill at 15,000 feet, against accurate enemy small arms fire, Hav Sultan Singh pressed on with the attack. After reaching near to the objective Hav Sultan Singh realized that the enemy Medium Machine Gun was proving dangerous and had to be neutralized somehow if the advance was to continue. At this stage, he ordered his section to assault area Rock and he himself rushed towards the enemy medium machine gun, firing from his weapon. When his ammunition ran out, Hav Sultan Singh displaying rare courage, charged on to the medium machine gun taking the complete fire on to himself and neutralized it. Inspired by Hav Sultan Singh’s dare devil action his section troops fought valiantly and captured the assigned feature, paving the way for onward battle for Tololing. 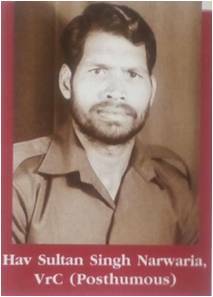 Hav Sultan Singh Narwaria was given the gallantry award, “Vir Chakra” for his unparalleled courage, fighting spirit and supreme sacrifice. 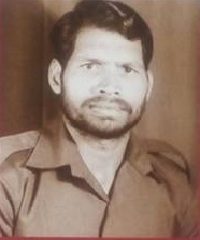 He is survived by his wife Shiela Devi, and sons Devendra & Jitendra. elder brother Sikandar Singh. On 12th/13th June 1999, Havildar Sultan Singh Nanvaria was the section commander of Number One Section, which was tasked to capture area Rock of Point 4590 in the Drass sector during ‘Operation Vijay’. The success of the company attack hinged on his ability to capture area Rock and establish a foothold on the feature. After having deployed the fire support base, Havildar Nanvaria attempted to approach area Rock from a flank. The enemy holding area Rock in strength readjusted itself to bring down effective fire on him and his section. Despite heavy odds of attacking up hill at 15,000 feet, against accurate enemy small arms fire, Havildar Nanvaria fearlessly pressed on. At this stage, he ordered his section to assault area Rock and he himself rushed towards the enemy medium machine gun, blazing away his weapon. When his ammunition ran out, he charged on to the medium machine gun taking the complete fire on to himself and neutralized the medium machine gun before succumbing to his injuries. Inspired by his gallant action and supreme sacrifice the section assaulted area Rock and captured it. Havildar Sultan Singh Nanvaria displayed gallantry of the highest order and made the supreme sacrific. Can I get contact of his sons Jitendta and Devendra? ?